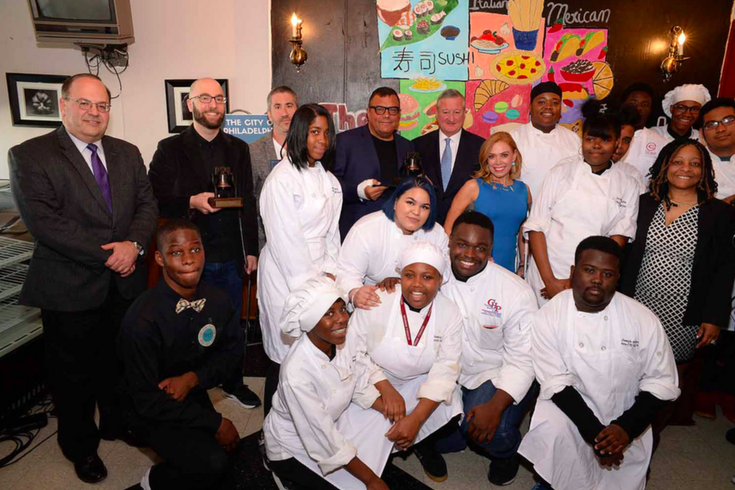 James Beard Award winners Michael Solomonov, Stephen Starr and Greg Vernick pose with students and staff from Murrell Dobbins CTE High School. Also pictured are City Councilman Allan Domb, City Representative Sheila Hess and Mayor Jim Kenney. 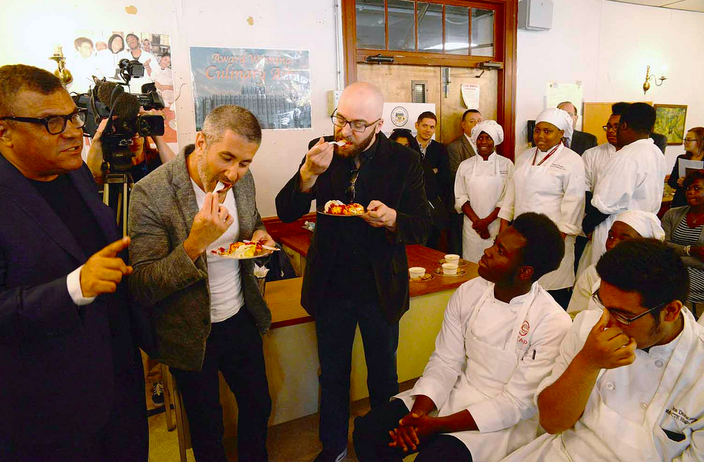 Local winners of the 2017 James Beard Award – arguably the city’s three best chefs and restaurateurs of now – tasted menu creations of several North Philly high school students Monday, providing a treat for both parties. 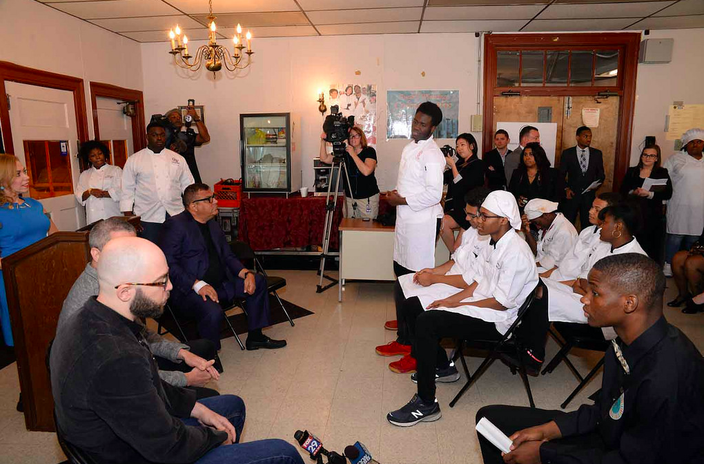 James Beard Award winners Michael Solomonov, Stephen Starr and Greg Vernick sat down with culinary students from Murrell Dobbins CTE High School for a panel discussion moderated by City Representative Sheila Hess. Each James Beard Award-winner was then presented with a city citation from Mayor Jim Kenney and an engraved desktop Liberty Bell, signifying the city’s appreciation of each restaurateur’s contribution to their craft. Michael Solomonov, Stephen Starr and Greg Vernick taste a pepperjack cheeseburger dip dish and a manicotti dish prepared by students from Murrell Dobbins CTE High School on Monday, May 15, 2017. Last month, Solomonov received the 2017 James Beard Award for Outstanding Chef for his restaurant, Zahav. Stephen Starr of STARR Restaurants took home the 2017 James Beard Award for Outstanding Restaurateur, and Greg Vernick, chef and owner of Vernick Food & Drink, received the 2017 James Beard Award for Best Chef – Mid-Atlantic. “These guys dominate the [restaurant scene] in Philadelphia,” Hess said as she described the men to the students. Once Q&A got under way, the high school students got to ask each restaurateur a question relating to what inspired them to become a chef or get into the restaurant industry. Solomonov said that several events in his life led to his delve into cooking Israeli food. In 2003, his brother was killed overseas during a military campaign. He said he dropped out of college midway through his studies and moved back to his birthplace of Israel. “I walked up and down the street and eventually got a job at a bakery, and that’s how it started,” he said. Growing up, Vernick said his grandfather was a butcher and his mother owned a restaurant, so he was familiar with the environment. Michael Solomonov, Stephen Starr and Greg Vernick listen to culinary students from Murrell Dobbins CTE High School explain their dreams of becoming chefs on Monday, May 15, 2017. “I was going into high school and playing basketball at summer camp and my father said, ‘No more camp. You’ve gotta get a job.’ So, it was the first thing I thought of to say, ‘Well, I know restaurants,’ and that was my first job that I got during the summers, and it just kind of caught me like a bug,” he told the students. Starr’s story is a bit different. He started off in the music business before he got into the restaurant industry. He offered the teens a few words of advice. “All you guys that are trying to learn to be great chefs, don’t just stick to where you are, learn who the great chefs are, see what they’ve accomplished and how they got where they are,” he said. Murrell Dobbins CTE High School is one of the city’s first “community schools,” a relatively new initiative that has been funded by the Philadelphia soda tax. High school students Donte Abney, 18, and Dawud Brown, 17, will be graduating this year. Both prepared for all three chefs a pepperjack cheeseburger dip. Latisha Jacobs, 17, made a manicotti dish. She, too, will be graduating this spring. Mayor Kenney told his own story of how he got started at his first job, and it wasn't in politics. You know what they say, in this town, now we're cookin' with gas." "I started out as a dishwasher at a restaurant right off of South Street called Luigi’s," he said. "It was owned by a little man who always wore an apron in the kitchen over a $4,000 suit. I washed dishes for a while, then worked my way up to bus boy and then bartender. So, I really saw how the restaurant functioned. "You know what they say, in this town, now we're cookin' with gas."